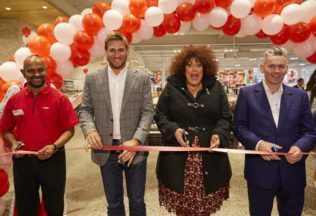 Coles Aurora Village Store Manager Ranjith Fernando, Chef and Coles Fresh Advisor Curtis Stone, award-winning singer Casey Donovan and Coles Managing Director John Durkan officially open the 800th Coles supermarket in Epping North on 21 June. Located in the Melbourne suburb, Epping North, the 800th store comes after 103 years since Coles was first established. The new store features a self-service olive bar, a ‘scoop and weigh’ station and an extensive range of fresh produce displayed on ice. Approximately 115 new jobs will be created from the new store opening. Despite opening its 800th store, Coles still sits behind Woolworths in store numbers. Woolworths currently has 922 supermarkets operational Australia-wide. Aldi is continuing to open more stores within Australia, particularly focusing on its expansion into Western Australia and South Australia. In February 2017, Aldi announced it will be opening 14 new WA stores and 10 new SA stores by the end of 2017. Aldi has a long-term plan to have a total of 70 WA stores and 50 SA stores.